Thomas Whittemore (1871-1950), on the left on the photo, was an active member of the Committee for the Relief of War Refugees in Russia and the Society for Relief Work among the Orphan Children of Russia. The goal of these organizations was to educate the most promising young Russians in the arts and sciences such that they could help rebuild their country. 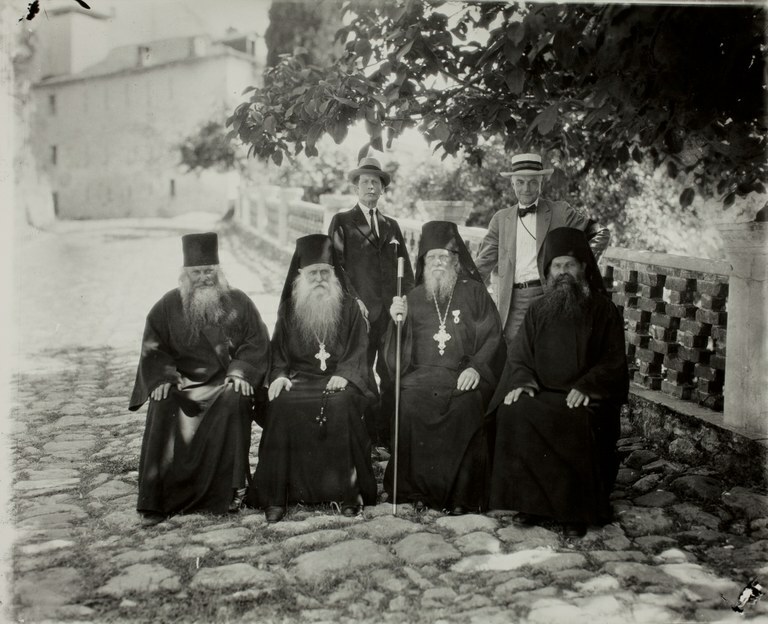 Whittemore also travelled to Mount Athos, Greece in 1923 with George D. Pratt (the man on the right), where he and Pratt delivered food and supplies to the Russian and Bulgarian monks that became impoverished after the Russian revolution. George Dupont Pratt (1869 – 1935) was an American conservationist, philanthropist, Boy Scout sponsor, big-game hunter and collector of ancient antiquities. 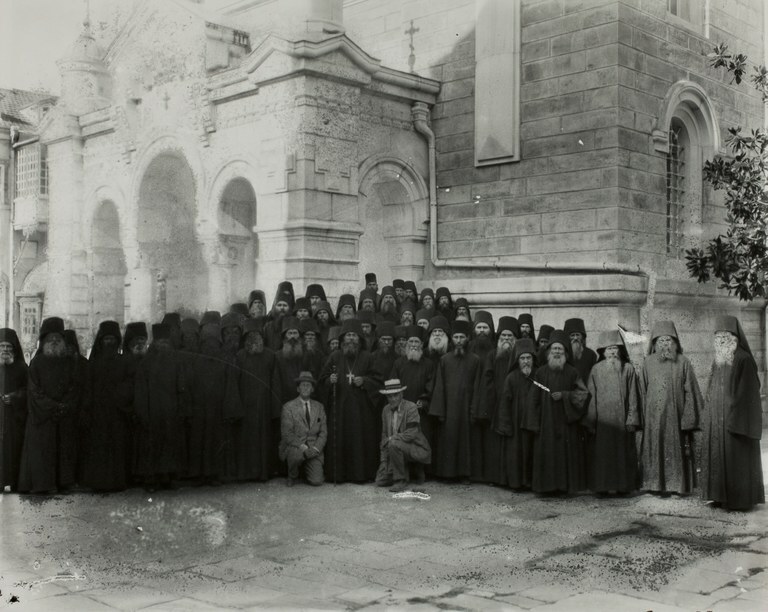 Both gentlemen posing with the abbot of the Russian monastery of Panteleimonos. 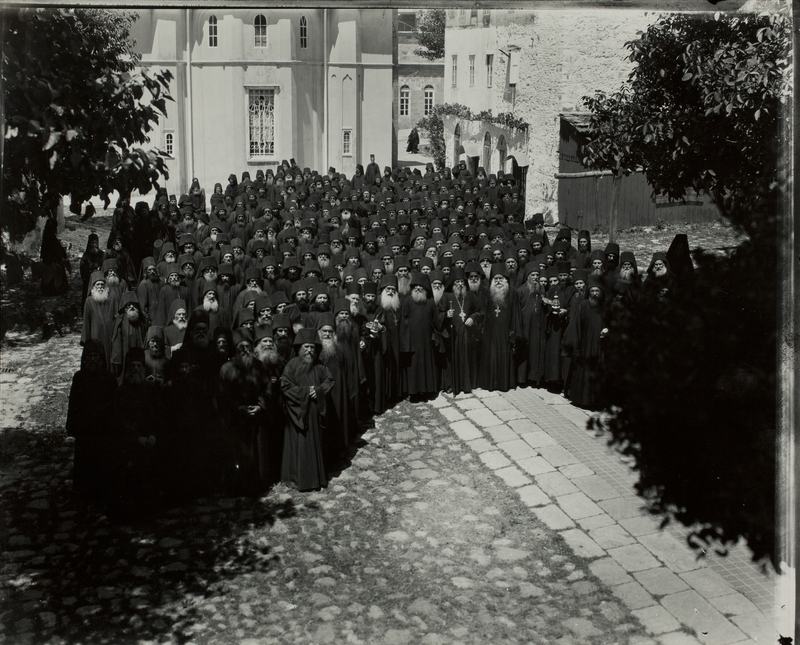 Although the Russian revolution ended the arrival of new monks in 1917 to Mount Athos there are still some present in 1923 in the courtyard of Panteleimonos. Every pilgrim who ever had a meal in the Trapeza of Panteleimonos never experienced that all seats were taken. 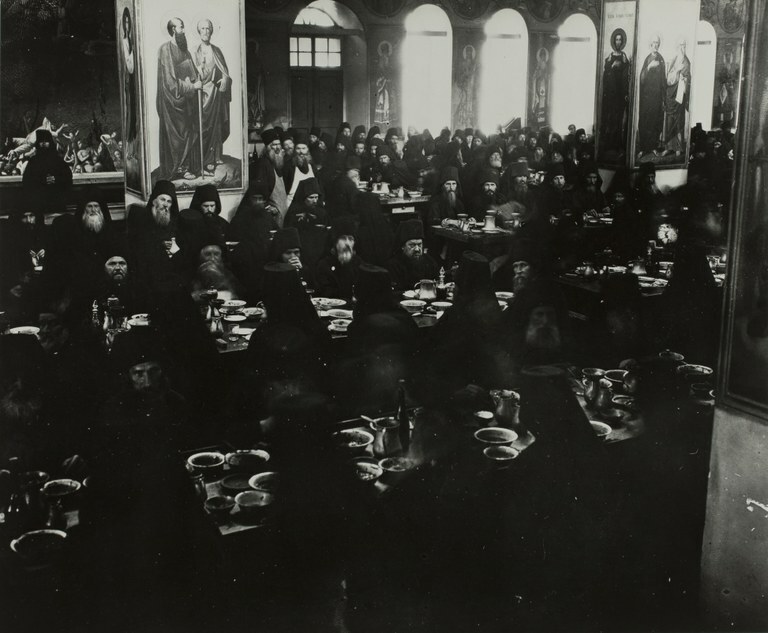 In 1923 the enormous refectory was still full with monks. 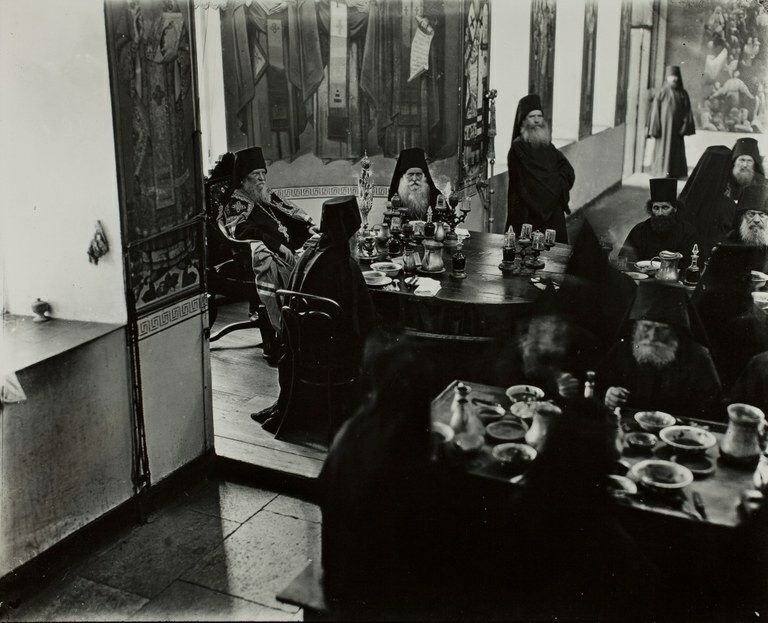 On the right the abbot at a round table. 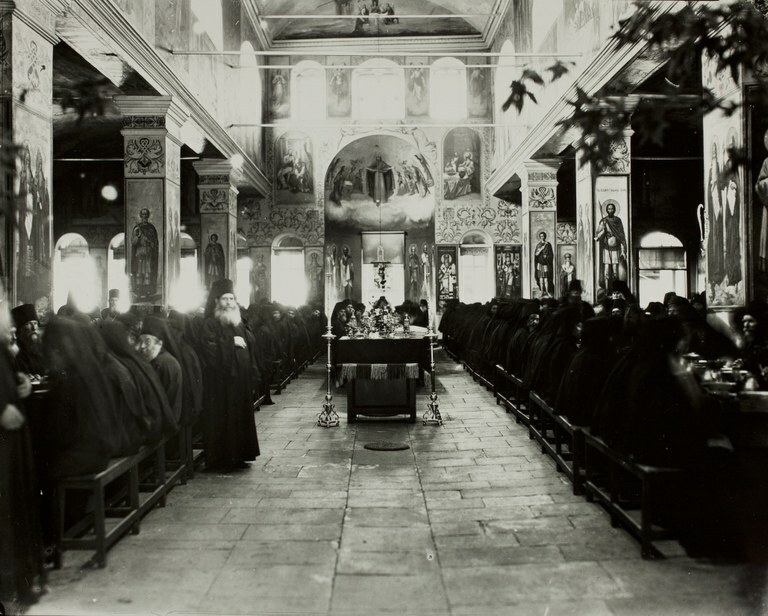 The katholikon in 1923. Whittemore and Pratt in the then Russian Skiti Profitou Eliou in 1923. Abbot was prior Ioann. Nicholas Fennell writes in his book The Russians on Athos that the skiti was now selling articles it no longer needed mainly to Pantocrateros such as mules, crosses, embroidered rugs and rails and other metal scrap. He writes “ by 1924 most of the brethren had no doubt resigned themselves to death in hardship and infirmity. They had appealed to the Serbs, Americans, and even the Bulgarians and British for help, but they knew that the occasional charitabele donation would bring only temporary relief”. This entry was posted in 19 Panteleimonos and tagged russians. Bookmark the permalink.